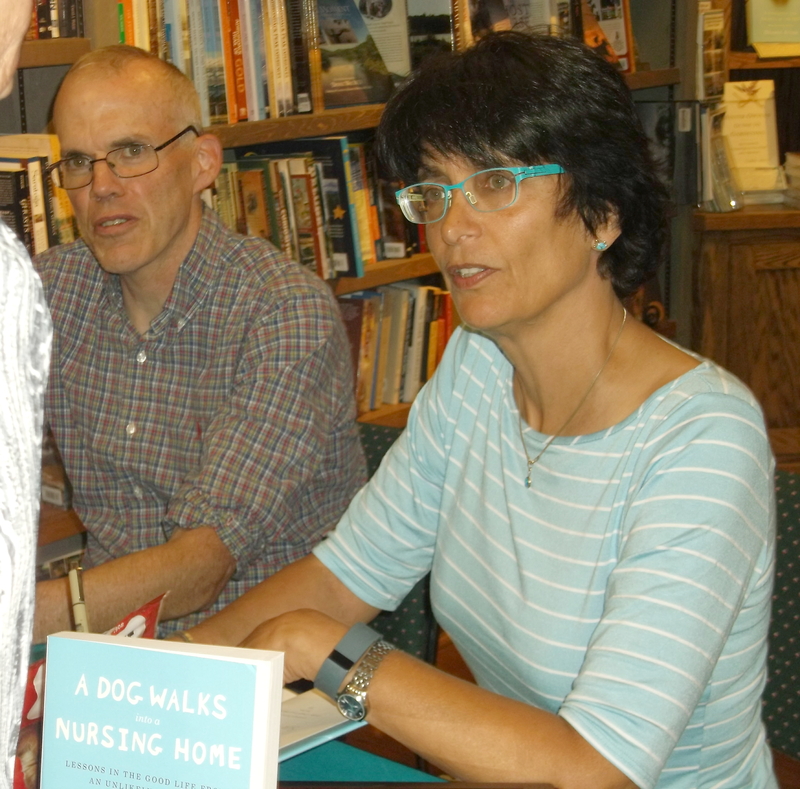 On August 14, at Northshire Bookstore in Saratoga Springs, two prominent authors read from, discussed, and signed their books: Sue Halpern’s A DOG WALKS INTO A NURSING HOME and Bill McKibben’s WANDERING HOME. 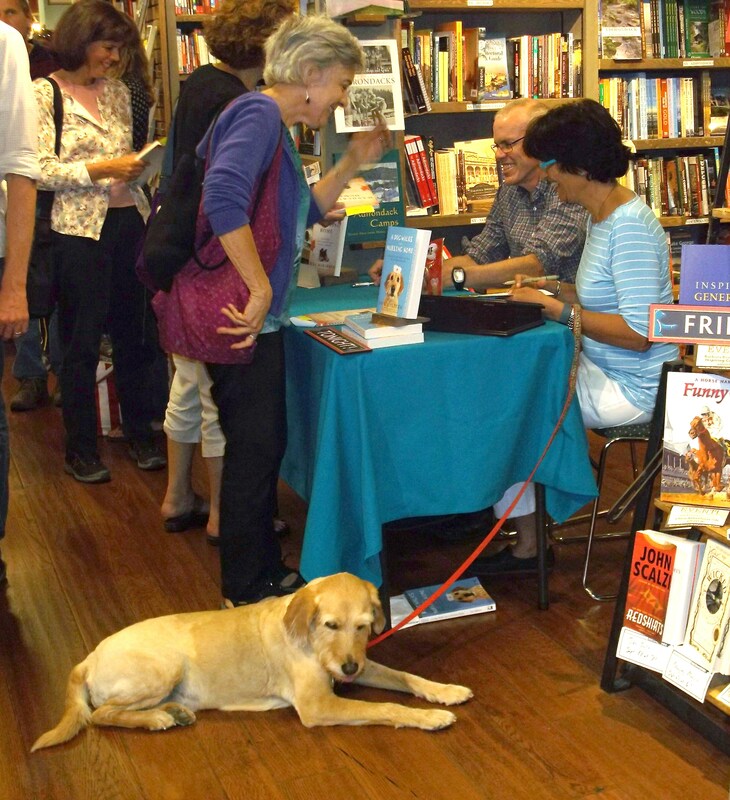 I was tempted to title this post: “Therapy Dog Upstages Two Distinguished Authors at Northshire Bookstore in Saratoga Springs,”– but I thought better of it. 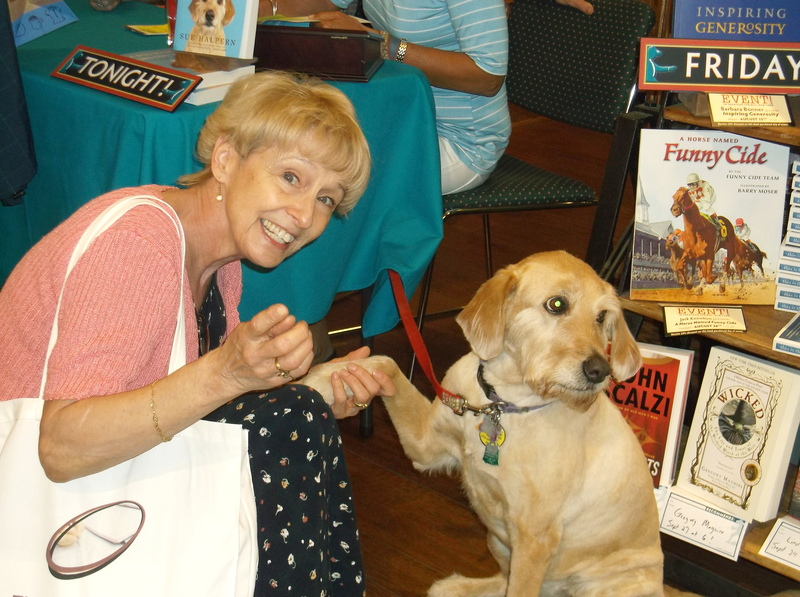 You see, the audience was seated and waiting for the authors to arrive, when up the center isle walked Pransky, Sue Halpern’s therapy dog, who also walked into a nursing home. Pransky sweetly greeted folks, walked toward the podium, and found a comfortable spot to relax. When she arrived, Sue Halpern walked Pransky toward the audience for a more formal introduction. For a second time, the labradoodle was petted, tapped, and ear-rubbed with oos and ahs and a clear, “I love you!” from one ardent admirer. Pransky, better known as “Pranny” to Sue Halpern and her husband, Bill McKibben, went on to win hearts and hugs for the rest of the evening. Sue Halpern has written for publications including: The New York Times Magazine, Glamour, The New York Review of Books, Good Housekeeping, Mother Jones, Rolling Stone, The New Yorker and Conde Nast Traveler. She has authored five critically acclaimed books, on subjects ranging from butterflies to memory and aging. Halpern was a Rhodes Scholar and a Guggenheim Fellow, and is a scholar-in-residence at Middlebury College, Vermont. 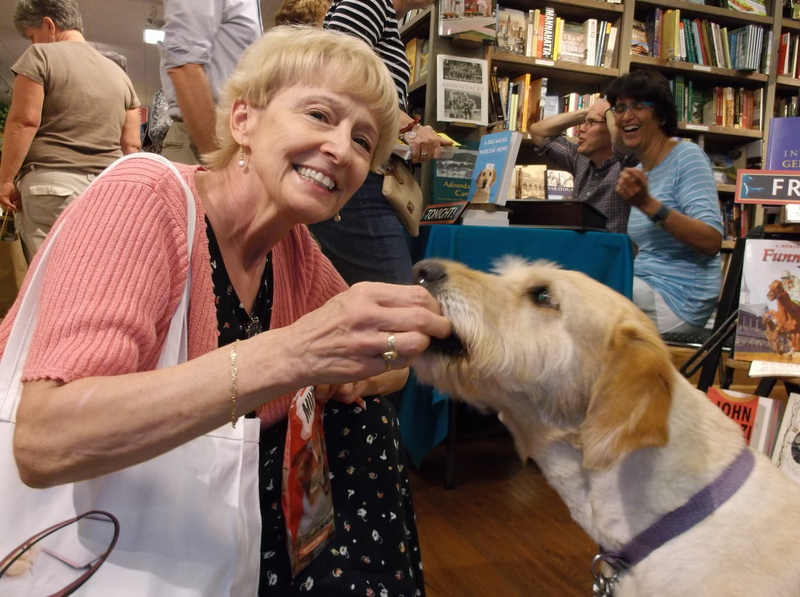 In A DOG WALKS INTO A NURSING HOME, Sue Halpern applies her knowledge and background, including a doctorate from Oxford and work in prisons and hospitals, to write about her experiences as a therapy dog team with her well-behaved and highly engaging dog, Pransky. 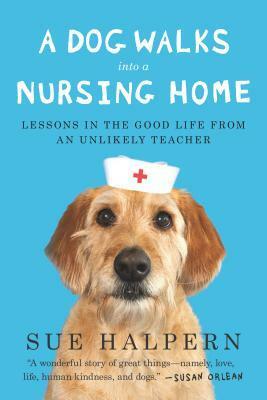 She describes finding unexpected meaning and pleasure by volunteering in a public nursing home, and brings readers a new kind of dog book that offers lessons in virtue from a richly diverse group of nonagenarians. SMP: Your title and cover really capture one’s attention. How did you choose the title and the cover with Pransky wearing a nurses’ cap? Did you work with an art director for the cover? SH: I kicked around a number of title ideas but none of them seemed quite right. Then one day the title “A Dog Walks Into a Nursing Home” just came to me, and I thought it was both appropriate and playful, so I ran it by my editor and she liked it a lot, and she ran it by her people at Riverhead and they liked it, and that was that. The cover was designed by the art director at Riverhead. She had the concept, and wanted to bring Pransky to NYC for a photo shoot. Actually, she said, “I want to shoot your dog,” which alarmed me, but then I realized she meant she wanted Pransky to be on the cover. I explained that bringing her to a photo studio in the city was probably not going to yield the best results, so a photographer was dispatched to our house in Vermont. The photo shoot lasted three somewhat hysterical hours, especially because the photographer forgot after a while that her subject was a dog. “Pransky, smile,” she kept saying. SMP: Can you describe your writing routine? SH: I can’t honestly say that I have a routine, but when I’m working on a book I tend to spend as much time doing the research and reporting as I do the writing. When I have finished the research part I make an informal outline so I can see how things fit together, so when I sit down to write, I know where to go, though that often changes as I’m actually writing. I usually give myself a word limit every day. Sometimes it takes four hours to get there, sometimes fourteen, but if I’m disciplined I don’t stop till I have put in the words. I do a lot of self-editing, so I often am crossing out more words than I’m writing, which is frustrating. SMP: You write that Pransky comes home after working and sleeps, tired out from being such a patient therapy dog for two hours. Does she show any indications that she is proud of herself for working hard? SH: My sense is that Pransky has internalized that she works at the nursing home, which is to say that it’s just what she does. I know she loves being there, but I don’t think it’s a matter of pride, just a matter of fact. SMP: How is Pransky doing these days? Is she still visiting the nursing home on Tuesdays? SH: Pransky turned 12 in July, and this month began her sixth year at the nursing home. But it is bittersweet because in June she was diagnosed with an aggressive cancer, and while she is doing quite well, all things considered, it is pretty clear that her time with us is coming to an end. What has been so gratifying is how the residents and staff at the nursing home have rallied around her. SMP: Often when visiting my mother in her nursing home over the years, I found it difficult to avoid becoming attached to the other residents, difficult to avoid internalizing their pain, both physical and emotional. I could leave and try to put it out of my mind. However, in writing this book, you took these folks home with you, and thought about them while writing. Did/does it pose a challenge to avoid becoming personally attached? Any advice for others who deal with the issue? SH: Empathy is a large part of what makes us human. Better to embrace it than shy away. SMP: Your book raises many issues that our elderly face, as well as some solutions, such as David Dworkin’s air conducting … “goodness is ours to dispense,” and shopping day, “…the distinction between giving and receiving is often blurry and sometimes false…” Did you have in mind to encourage volunteerism as well as raising awareness? SH: The quick answer here is “yes.” I was hopeful that others would read the book and get inspired to do something similar. I thought that by demystifying the nursing home, people might be less hesitant to volunteer there, and by showing what it is like to spend time there with a dog, they might realize that they can do something similar. SMP: One of my favorite quotes from your book is: “…fortitude was not a virtue consciously practiced but rather one that accrued….And this: the reward for getting through life is getting life itself.” Do you have a favorite quote? SH: Oh that’s too hard a question! I take the 5th. SH: The best way to be a writer is to write. Sounds simple, and is simple—sort of—but people put up all sorts of obstacles in their own way. Since the world already puts up obstacles, don’t be complicit. And don’t worry about your first draft. Just get the ideas down and the words down. You can always go back to work to make them better and better. But you can only rewrite once you’ve written—so get to it! On a personal note, I loved meeting Pranny, but I wasn’t able to get an interview because her interpreter, Sue Halpern, was busy signing books. However, I can provide this link to a previous Pranny interview for readers to enjoy: http://suehalpern.com/pransky_interview.pdf. Even bribing with treats didn’t work for a Pransky interview! 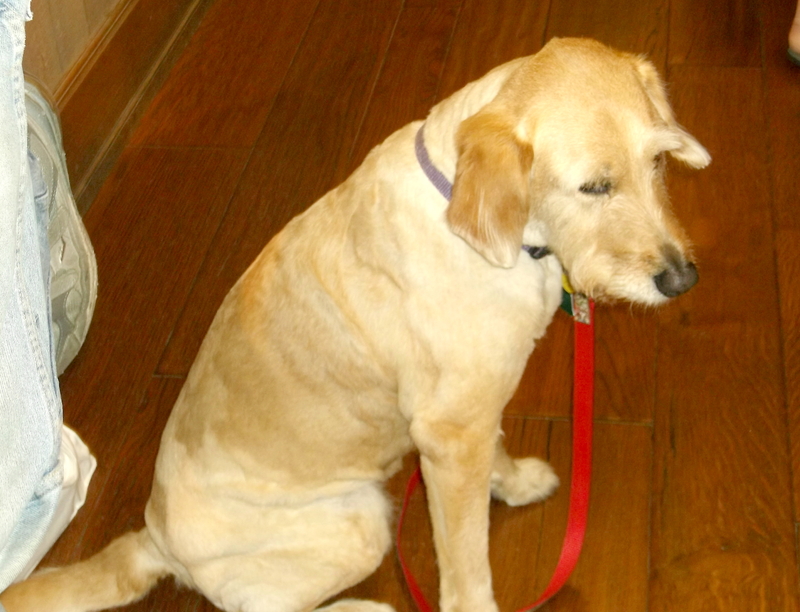 For more information regarding aging and/or therapy dogs, visit Halpern’s website link: http://suehalpern.com/links.html. The Writers’ Loop wishes to thank Sue Halpern for participating in this interview, and Northshire Bookstore for gracing Saratoga with yet another in its rich array of author presentations. Categories: Uncategorized | Tags: author, Bill McKibben, book signing, Nursing homes, Sue Halpern, Therapy dogs | Permalink. Raani, Thanks for stopping by and commenting. It was a great experience!